Dedicated to the individuals who have donated their bodies to Mayo Foundation for anatomical study so that others might live. The vaults — one established in 1985, the other in 2000 — hold the remains of Mayo Clinic patients who donated their bodies to medical research. 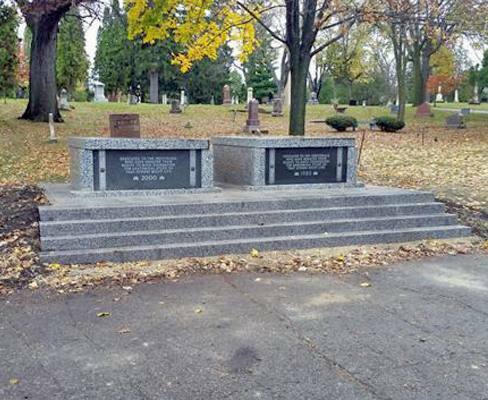 Recently, Terry Regnier, Anatomical Services, decided something needed to be done to "spruce up" the sites and "better honor" the gifts of those whose remains lay inside. Regnier brought his request to Doug Holtan, Facilities and Support Services, who enlisted the services of Senior Construction Manager Dave Eide, who eagerly took up the challenge. "I started by taking a drive out there to look at the plots, and then I worked with Terry on a couple options," Eide says. Those options included detailed sketches of what Eide thought could be done to give the site a stronger visual presence. "One option was to create a set of big, focal steps from the front," he says. "Another was to build more of a flat, wall-like area so you could walk up to them without having to walk up any steps." The "steps option" won out. The good folks in Anatomical Services liked that option because they felt that "the steps are something people can sit on and use to spend some time there," Eide says. Next, Eide and his crew visited the stone yard where "a variety of different granites and marbles" leftover from Mayo Clinic construction projects are housed. "We found exactly what we wanted — a perfectly complementary granite," he says. Then they worked to "mock everything up" at the stone yard so they wouldn't cause any unnecessary noise or mess to the cemetery. "The crew laid everything out right there at the stone yard," Eide says. "They then hauled it all to the cemetery and graded the area before putting it all in." Thanks to all of that prep work, Eide says the installation itself went quickly. The only thing left to do now, he says, is some touch-up work. "There are a few joints that need attention," he says. And, "this coming spring, we'll do some seeding" to finish the job. When they are done, Eide says he hopes the families of the donors will like the site's new look as much as he's enjoyed helping make it happen. You can tell us what you like by sharing your comments below. Then, you can use the social media tools to share this story with others.